London to Slovenia . . . 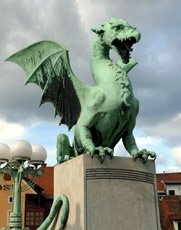 It's easy, comfortable, affordable and safe to travel from the UK to Ljubljana by train, leaving in the morning and arriving the following afternoon with an overnight stop in Munich. This page will explain the routes, train times, fares and how to buy tickets. GMT+1 (GMT+2 from last Sunday in March to last Saturday in October). UK citizens do not need a visa to visit Slovenia. 20 February 2019. Train times valid 9 Dec 2018 to 14 Dec 2019. Option 1, London-Paris by Eurostar, Paris-Munich by TGV, overnight stop in Munich, Munich-Ljubljana by day train - the all-daytime option. Option 2, London-Paris by Eurostar, Paris-Venice by sleeper train, day in Venice, late afternoon train to Trieste then Ljubljana. Option 3, London-Paris by Eurostar, Paris-Zurich by TGV-Lyria, Zurich-Ljubljana by direct sleeper train. Day 1: Travel from London to Paris by Eurostar, leaving London St Pancras at 10:24 (12:24 on Saturdays) arriving Paris Gare du Nord at 13:47 (15:47 on Saturdays). It's a 10 minute walk from the Gare du Nord to the Gare de l'Est. Day 1: Travel from Paris to Munich by 200mph double-decker TGV Duplex, leaving Paris Gare de l'Est at 15:55 Mondays-Fridays & Sundays arriving Munich Hbf at 21:36. On Saturdays it leaves Paris Est at 17:55 arriving Munich Hbf 23:29. There's a cafe-bar on board, and I recommend an upper deck seat for the best views. An earlier departure from London to Munich is possible on Saturdays, 09:24 arriving 19:27, with changes in both Paris and Stuttgart. Alternatively, you can also travel from London to Munich by Eurostar & ICE train via Brussels & Cologne, see the London to Germany page. Stay overnight in Munich. 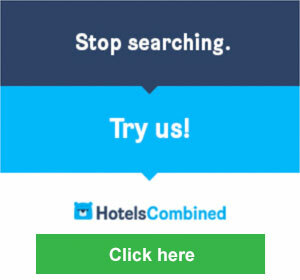 Hotels next to the station with good or great reviews include the Sofitel Munich Beyerpost, Eden Hotel Wolff, InterCity Hotel or (budget) the Pension Locarno. Day 2, travel from Munich to Ljubljana by train, leaving Munich Hbf at 08:17 by smart Austrian railjet train. 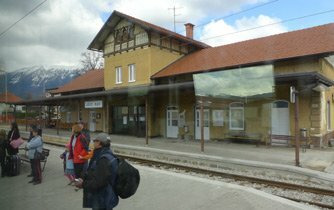 You need to make a simple cross-platform change onto a comfortable air-conditioned Slovenian & Croatian train at Villach on the Austrian/Slovenian border (arrive 12:43, depart 12:53) and you arrive in Lesce-Bled at 13:50 and Ljubljana at 14:31. 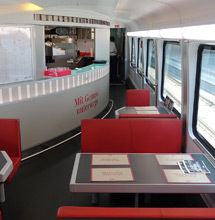 A restaurant car is available on the Austrian railjet train serving drinks, snacks and affordable full meals - in 1st & business class food orders are taken and served at your seat. The scenery through southeast Germany & Slovenia is stunning, with views of snow capped mountains, lush meadows & winding rivers, see the photos above. 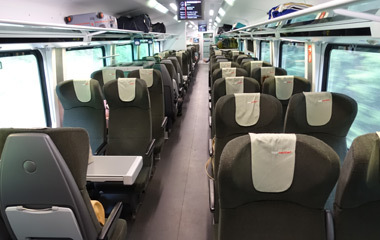 Day 1, travel from Ljubljana to Munich, leaving Ljubljana at 15:27 or Lesce-Bled at 16:13 on a comfortable air-conditioned Slovenian & Croatian train. You need to make a simple cross-platform change at Villach on the Austrian/Slovenian border (arrive 17:07, depart 17:16) onto a smart Austrian railjet train which arrives at Munich Hbf at 21:42. In summer when it's light you can enjoy the lovely mountain scenery over dinner in the railjet's restaurant car. Alternatively, you can take the earlier direct EuroCity train leaving Ljubljana at 09:23 or Lesce-Bled at 10:03, arriving Munich Hbf at 15:41. 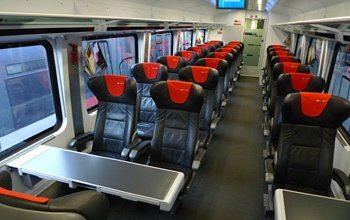 This is a classic Austrian train with 6-seater compartments in both 1st & 2nd class, and it's direct with no need to change trains at Villach. Take your own provisions as there's no restaurant or buffet car until the Austrian frontier, reached around 10:58. 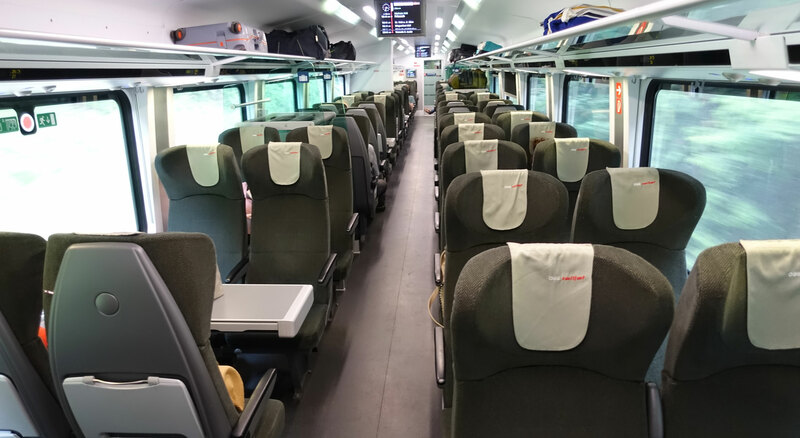 This direct train is perhaps the better option, especially in winter when you'll see all the fabulous scenery along the Sava river and through the mountains of Austria in daylight. Day 2: Travel from Munich to Paris by 200 mph double-decker TGV Duplex, leaving Munich Hbf at 06:46 (06:23 on Sundays), arriving Paris Gare de l'Est at 12:33 (12:05 on Sundays). A café-bar is available. I recommend an upstairs seat for the best views. In Paris, it's a 10-minute walk from the Gare de l'Est to the Gare du Nord. Day 2: Travel from Paris to London by Eurostar, leaving Paris Gare du Nord at 15:13 and arriving London St Pancras at 16:39. If you'd prefer a leisurely breakfast in Munich, there are later departures from Munich to Paris & London, see the London to Germany page. You can also travel from Munich to London by ICE train & Eurostar via Cologne & Brussels, see the London to Germany page. London to Paris by Eurostar starts at £44 one-way or £58 return in 2nd class, £112 one-way or £168 return in 1st class. Like air fares, the price rises as cheaper seats are sold, so book early for the best price. 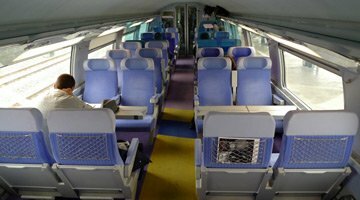 Munich to Paris by TGV starts at €39 each way in 2nd class or €69 in 1st class. London to Munich start at €69.90 each way with a Sparpreis London ticket if you go via Brussels & Cologne. 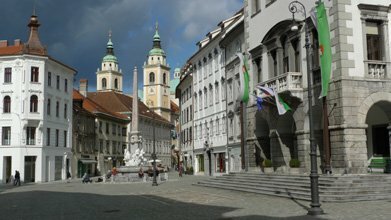 Munich to Ljubljana starts at €39 each way in 2nd class, €69 in 1st class. All these prices vary like air fares, rising as the cheaper tickets are sold and departure date approaches, so book as early as the booking horizon allows. See this section on the London to Germany page for train times, fares & how to buy tickets between London & Munich via Paris. See this section on the London to Germany page for train times, fares & how to buy tickets between London & Munich via Brussels & Cologne. 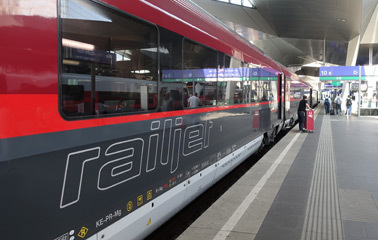 Then use the journey planner at the German Railways website www.bahn.de (use this special link) to bring up the Munich-Ljubljana train shown above, and buy the ticket. 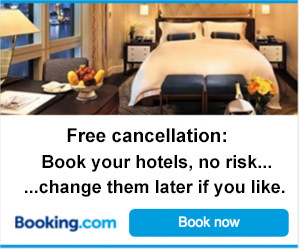 It will show if any cheap special fares are available. Tickets can be sent to any address, or in some cases printed out yourself. Avoid any departure marked 'BUS' as these are buses not trains, but the special link adds 'Kranj' in the via box which eliminates the buses from the search results making the trains easier to see. If you prefer to book by phone, just call Deutsche Bahn's UK office on 08718 80 80 66 (lines open 09:00-20:00 Monday-Friday, 09:00-13:00 Saturday & Sunday, no booking fee, 2% credit card charge but no charge for debit cards). If you want a custom-made trip with rail travel, hotels & transfers all arranged for you, contact Railbookers. Just tell them what you want, and they'll advise you on the best trains, routes & hotels and sort it all out. They get very positive reviews, and look after their customers very well. UK call 020 3327 0761, www.railbookers.co.uk. US call free 1-888-829-4775, see website. Canada call free 1-855-882-2910, see website. Australia call toll-free 1300 971 526, see website. New Zealand call toll-free 0800 000 554 or see website. 1st class: Standard Premier or Business Premier. Sit back with a glass of red and enjoy the ride - book an upper deck seat for the best views. 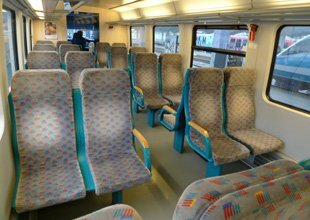 The train is equipped with power sockets for laptops & mobiles at all seats in both classes, and a cafe-bar serves drinks, snacks & microwaved hot dishes. The train soon leaves the Paris suburbs behind and speeds across a vast wide open plateau of woods & farmland at up to 200mph, past picturesque French villages of the Champagne region. An hour or two later, the train leaves the high-speed line and slowly meanders through pretty wooded hills, the countryside eventually flattening out towards Strasbourg. On leaving Strasbourg, look out for Strasbourg cathedral on the left with its famously missing second tower. Minutes afterwards you rumble across the river Rhine into Germany, before heading on to Stuttgart & Munich. 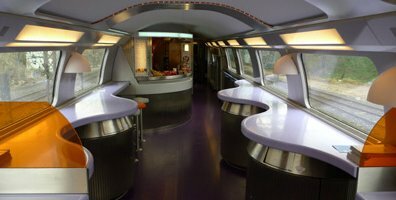 Cafe-bar on upper deck in car 4, serving tea, coffee, soft drinks, wine, beer, snacks & microwaved hot dishes. 2nd class seats on the upper deck. There's a mix or tables for 4 and unidirectional seating. 360º photo. 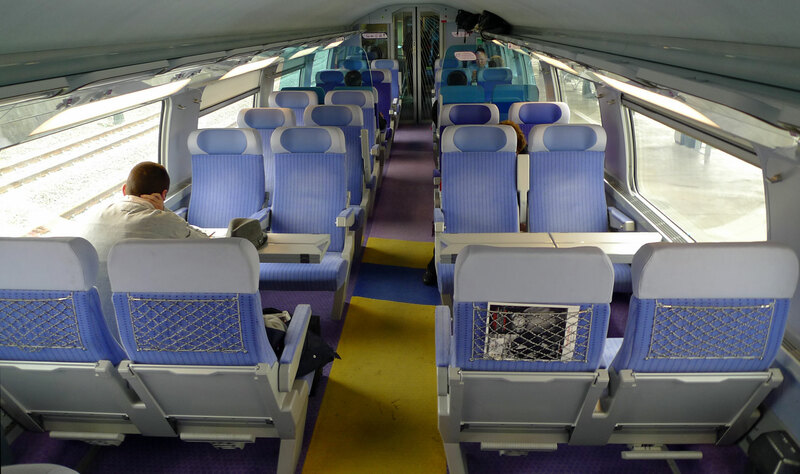 1st class seats on upper deck, a club duo on the left, a club quatre on the right. 360º photo. 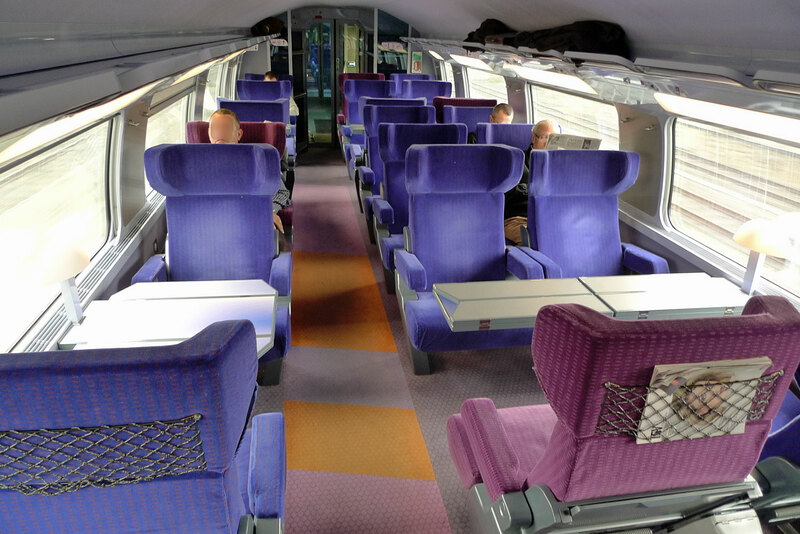 A TGV Duplex. The red near the door indicates 1st class, pale green indicates 2nd class. 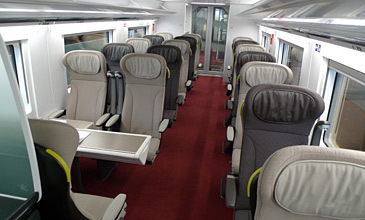 Economy class on railjet, in open saloons with large windows. Some seats around tables, most unidirectional. 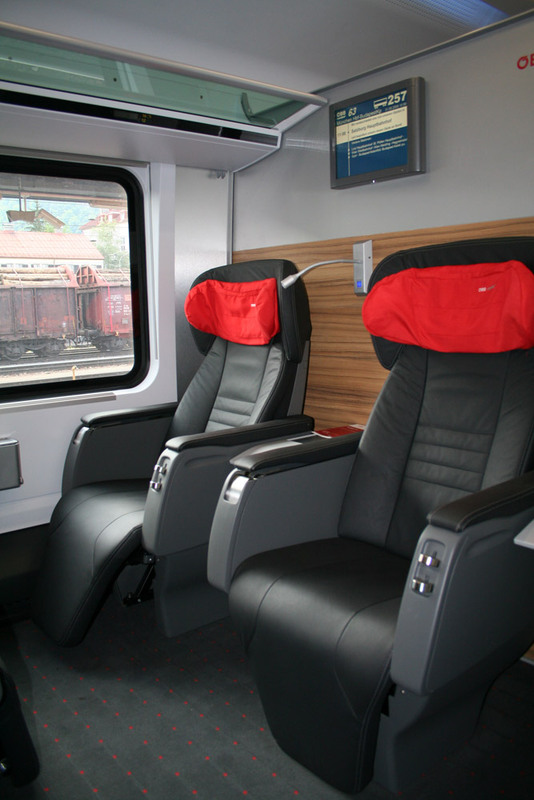 Comfortable seats: Some 2nd class seats are also arranged 2+1 abreast, the same as 1st class! You can also travel from London to Ljubljana via Paris & Venice. 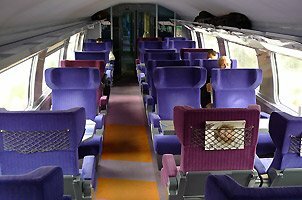 Step 1, take a lunchtime Eurostar from London St Pancras to Paris Gare du Nord and the Thello sleeper train from Paris to Venice leaving Paris Gare de Lyon at 19:15 and arriving Venice Santa Lucia at 09:35. For details see the London to Italy page. Enjoy most of a day in Venice. Left luggage is available. Step 2, take a late afternoon train from Venice Santa Lucia to Trieste Centrale and the evening train to Ljubljana as shown on the Venice to Ljubljana page. This works in the other direction too, with the morning train from Ljubljana, best part of a day in Venice, sleeper to Paris & Eurostar back to London. You can also travel from London to Ljubljana via Paris & Zurich. Step 1, take a morning Eurostar from London St Pancras to Paris Gare du Nord in 2h20 then a TGV-Lyria high-speed train from Paris Gare de Lyon to Zurich HB in 4h05. Just make sure you allow at least 2 hours between trains in Zurich. For full details see the London to Switzerland page. Step 2, take the direct sleeper train leaving Zurich HB at 20:40 and arriving next morning at Lesce-Bled on Lake Bled at 07:30, Ljubljana at 08:13. It has couchettes (4 & 6 berth) and a really excellent modern air-conditioned Croatian sleeping-car with 1, 2 & 3 bed compartments with washbasin, see the Croatian sleeper video here. The scenery in the morning is wonderful, all along the River Sava between Ljubljana and Zagreb. Highly recommended! There's no catering car, so bring a picnic and bottle of wine along. Fares from €59 with couchette in 6-berth, €69 with couchette in 4-berth, €109 with bed in a 2-bed sleeper or €159 in a single-bed sleeper. 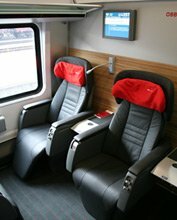 This sleeper train can now easily be booked online at the Austrian Railways website www.oebb.at, and you print your own ticket. Tip: There's no restaurant car, so have dinner before boarding your sleeper, see suggested restaurants on the Zurich HB station page. Step 1, take the direct sleeper train leaving Ljubljana around 21:10 or Lesce-Bled at 21:51 and arriving Zurich HB at 09:20. Fares start at €49 with couchette in 6-berth, €59 with couchette in 4-berth, €79 with a bed in a cosy 2-bed sleeper with washbasin, morning tea or coffee included, or €129 with a single-bed sleeper, morning tea or coffee included. 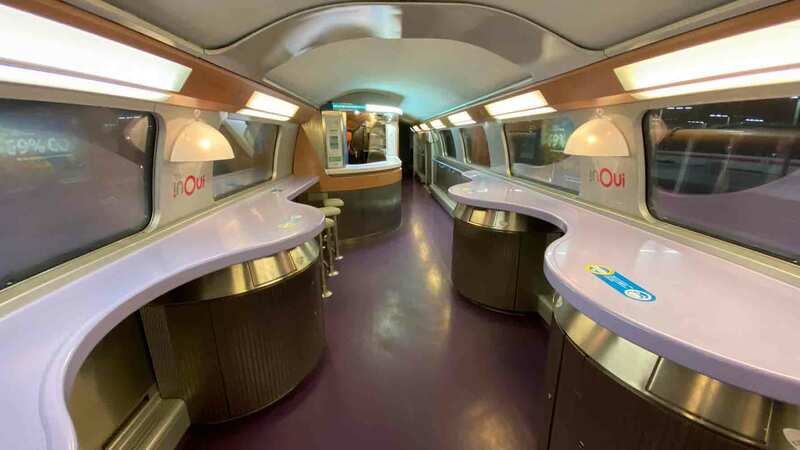 Tip: There's no restaurant car, so have dinner before boarding your sleeper. 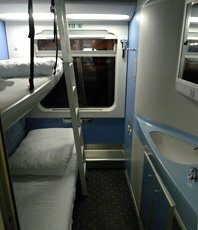 This sleeper train can now be booked online at the Austrian Railways website www.oebb.at, and you print your own ticket. Step 2, now take a late morning or lunchtime TGV-Lyria high-speed train from Zurich HB to Paris Gare de Lyon in 4h05. 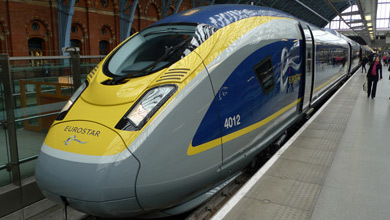 then an afternoon or evening Eurostar from Paris Gare du Nord to London St Pancras in 2h20. Just make sure you allow at least 2 hours between trains in Zurich. For full details see the London to Switzerland page. 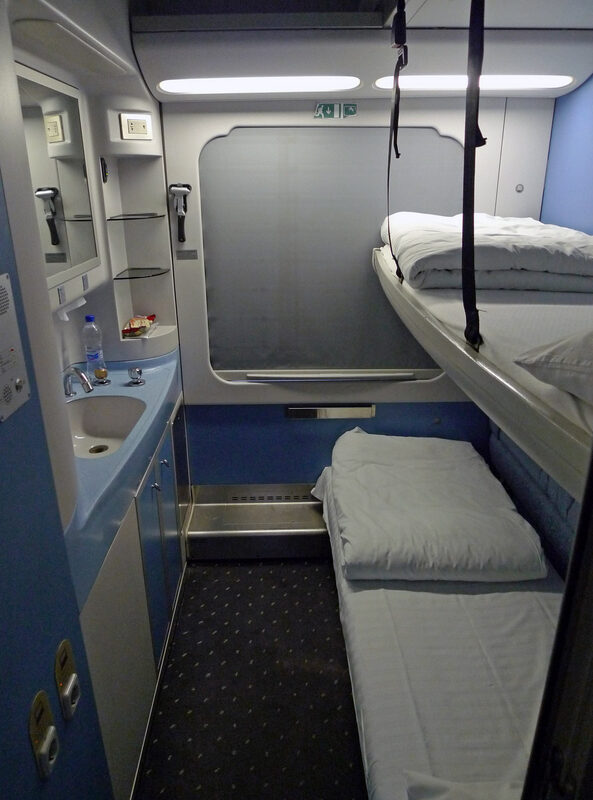 The Zurich-Zagreb sleeping-car: The modern air-conditioned Croatian sleeping-car from Zurich to Zagreb has 10 compartments with washbasin, each of which can be used as a 1, 2 or 3 berth room, with toilets at the end of the corridor. It's identical to the Zagreb-Munich sleeper, see the Croatian sleeper video. See larger sleeper photo. Ljubljana is a wonderful city to visit, you'll find tourist information at www.visitljubljana.si. The station is just a few minutes walk from all the central hotels and you can easily walk between all the sights and places of interest. See the Dragon Bridge, the Franciscan church, the triple bridge, and of course take the funicular railway up to the castle. The Best Western Premier Hotel Slon and City Hotel are both good choices. Try the traditional Slovenian dishes served in the Sokol restaurant just to the left of the town hall, one of Ljubljana's best-know eateries. Map of Ljubljana. 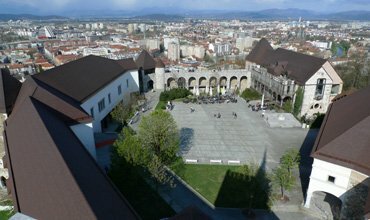 You arrive at Ljubljana railway station, only a few minutes walk from the city centre and all its hotels. 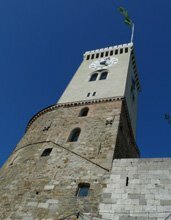 Take the funicular railway up to the castle and climb the watchtower for spectacular views over the city to the ring of mountains beyond. The old town main square, town hall & cathedral. The excellent Sokol restaurant is in the background. Travel from London to Ljubljana as shown above. 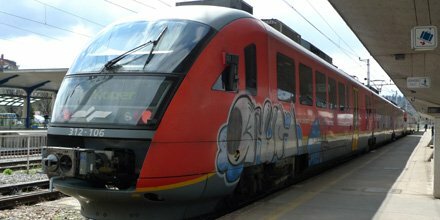 Trains link Ljubljana with Koper five or six times daily, journey time 2½ hours, fare €9. No reservation is necessary, just buy a ticket at the station and hop on. If you arrive in Ljubljana off the EuroCity from Munich, a train leaves Ljubljana at 15:42 arriving Koper at 18:13, 2nd class only. For other options, see www.bahn.de or www.slo-zeleznice.si. 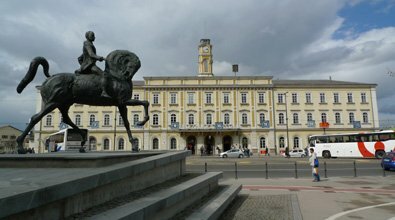 Trains link Koper with Ljubljana five or six times daily, journey time 2½ hours, fare €9. No reservation is necessary, just buy a ticket at the station and hop on. You can check times at either www.bahn.de or www.slo-zeleznice.si. Allow plenty of time for connections at Ljubljana, at least an hour. Buy tickets and check fares from London to Ljubljana as shown above. then simply buy a Ljubljana to Koper ticket at the station when you reach Ljubljana. ...The train to Koper, at Ljubljana. 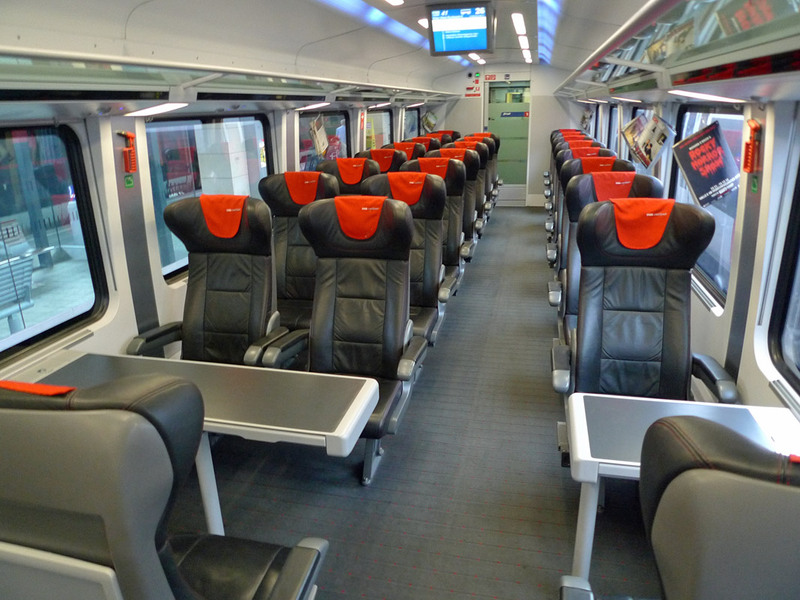 Most trains to Koper are modern, air-conditioned regional trains like this. There's a clever way to travel between Venice, Trieste & Ljubljana that's frequent, cheap, historically interesting and very scenic, and with two Slovenian trains a day now extended one stop across the border into Italy, it's easier than ever. For details, see the Venice to Ljubljana page. You should take a good guidebook. I think that the Lonely Planets and the Rough Guides are easily the best for the independent traveller. Both guides have plenty of background historical and cultural information, plus lots of practical information. You won't regret buying one of these guides..! My own book, an essential handbook for train travel to Europe based on this website called "The Man in Seat 61", was published in June 2008, and is available from Amazon.co.uk with shipping worldwide. The European Rail Timetable (formerly the Thomas Cook European Timetable) has train & ferry times for every country in Europe plus currency & climate information. It is essential for regular European train travellers and an inspiration for armchair travellers. Published since 1873, it had just celebrated 140 years of publication when Thomas Cook decided to pull the plug on their entire publishing department, but the dedicated ex-Thomas Cook team set up a private venture and resumed publication of the famous European Rail Timetable in March 2014. You can buy it online with worldwide shipping at either www.stanfords.co.uk or www.europeanrailtimetable.eu. More information on what the European Rail Timetable contains. A Traveller's Railway Map of Europe covers the whole of Europe from Portugal in the west to Moscow & Istanbul in the east, Finland in the north to Sicily & Athens in the south. On the back are detailed maps of Switzerland, Benelux & Germany, plus city plans showing stations in major cities. Scenic & high-speed routes highlighted. Buy it online for £14.50 + postage worldwide (UK addresses £2.80) at www.stanfords.co.uk/Continents/Europe-A-Travellers-Railway-Map_9789077899090.htm or (in the Netherlands) for €13 + €5.50 postage from www.treinreiswinkel.nl. 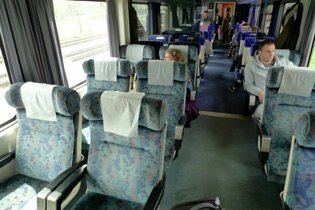 Railbookers can custom-make a flight-free holiday to Ljubljana & Zagreb, or indeed a train-based tour of Eastern Europe, with train travel, transfers & hotels all arranged for you, for however long you like, leaving on any date you like. If you tell them what you want, they'll advise you on the best trains, routes & hotels and sort it all out for you. They get a lot of repeat business and a lot of recommendation by word of mouth! Never travel without proper travel insurance from a reliable insurer with at least £1m or preferably £5m medical cover. It should also cover loss of cash & belongings (up to a limit), and trip cancellation. An annual multi-trip policy is usually cheapest even for just 2 or 3 trips a year - I have an annual policy myself. However, don't expect travel insurance to bail you out of every missed connection, see the advice on missed connections here. Here are some suggested insurers, Seat61 gets a little commission if you buy through these links, and feedback from using insurance for rail & ferry travel is always welcome. In the UK, use www.confused.com to compare prices & policy features across major insurance companies. If you're a UK citizen travelling in Europe, you should apply for a free European Health Insurance Card, which entitles you to free or reduced rate health care if you become ill or get injured in many European countries, under a reciprocal arrangement with the NHS. This replaced the old E111 forms as from January 2006. The EHIC card is available from ww.nhs.uk. It doesn't remove the need for travel insurance, though. Taking out an extra credit card costs nothing, but if you keep it in a different part of your luggage you won't be left stranded if your wallet gets stolen. In addition, some credit cards are better for overseas travel than others. Martin Lewis's www.moneysavingexpert.com/travel/cheap-travel-money explains which UK credit cards have the lowest currency exchange commission loadings when you buy something overseas, and the lowest cash withdrawal fees when you use an ATM abroad.